Is Erdogan 'Wagging the Dog' Against the Kurds in Turkey? In 1997, the movie Wag the Dog told the tale of an American President who created a fictitious war against Albania to distract from domestic scandals, ensuring reelection. Turkey's President Recep Tayyip Erdogan must have seen it, as he's following the same script against the Kurds in order to boost his party's flagging fortunes. But will it work? Like the embattled chief executive 1997 movie, Erdogan is in trouble in Turkey. A flagging economy is taking its toll on the Turkish lira. Erdogan's authoritarian style is starting to wear out its welcome after a dozen years. He's arrested people he doesn't like, and turns water cannons on peaceful protesters who tried to keep Gezi Park from closing. 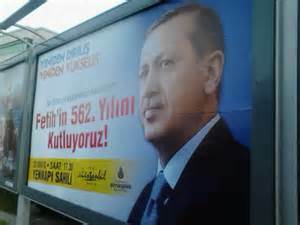 Despite holding a non-partisan office, Erdogan made sure his image was every in the 2015 election, like this poster that I snapped a picture of. He also dominated the airwaves. But most alarming was Erdogan's appetite for even more power. After functioning under parliamentary rules as the country's prime minister, the Turkish leader won the election for the presidency, a ceremonial role. Now he seeks a system with a powerful president, who can almost rule by decree. And a strong majority for his AKP political party could give him that. While in Turkey leading up to the June elections, I met a few enthusiastic AKP supporters. But I also met some very disgruntled citizens, publicly annoyed with Erdogan's actions and style. More disturbing were those afraid to say anything publicly, whispering their apologies, looking around nervously, and begging me not to quote them in an article. That's more the hallmark of an authoritarian state, instead of the democracy Turks want to live in. 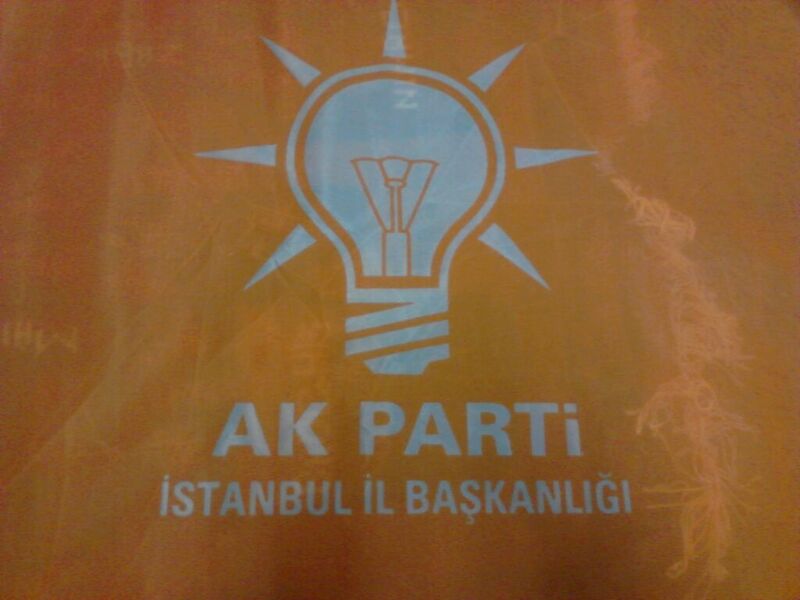 This image is from one of the many AKP flags I got from the 2015 election in Turkey. But enough Turkish voters stood up to Erdogan in the polls. His AKP lost their parliamentary majority that they held since 2003. The liberal CHP and nationalistic MHP bounced back, doing better than expected. Yet nothing was more surprising than the performance of the HDP, a Kurdish Party. With young, eager candidates, this party sought to appeal to all Turks, not just the ethnic minority. Their presence was pretty strong in Istanbul. Youthful male and female supporters handed out flags, pins, and brochures on the streets of the country's largest city. They smiled and clapped when, short of some Turkish lira, I gave them a few American dollars for a pin. And though you saw evidence of their flags knocked down or posters scratched, new ones seemed to pop up just as fast in the same neighborhood. 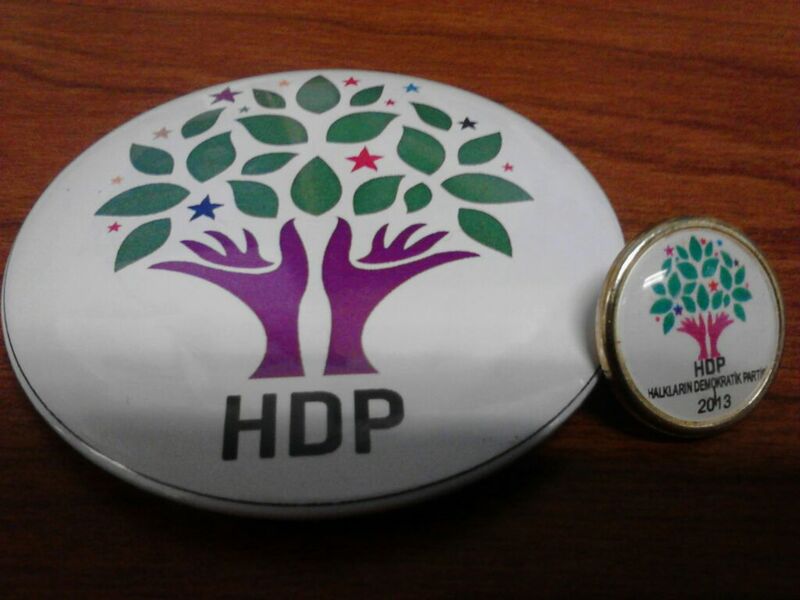 HDP buttons and pins from the 2015 election in Turkey that I bought. The CHP, MHP and HDP all cleared the country's insane 10% threshold for getting seats in the parliament (others with thresholds, like Germany and Israel, have much lower percentages for representation). That knocked the AKP from power, and no party wanted to form a coalition with the AKP, the largest party. Without the intimidation factor, the AKP certainly would struggle in a subsequent contest. And with the Turkish lira on the run, the AKP could do worse as the country fears a construction bubble. So Erdogan did what is known as the diversionary theory of conflict, or the "Wag the Dog" hypothesis in Hollywood. He broke off the peace talks and started bombing the Kurds, under the guise of attacking ISIS, infuriating America in the process. The thinking behind these theories is that an embattled leader can distract the population from a recession or scandal with a foreign war. In addition to the change in headlines, the chief executive hopes for a "rally 'round the flag" boost from the public, which often occurs during a war. Western pundits expected Erdogan might do something like this against ISIS in Syria, or something against the Assad regime, to reverse his political fortunes. But going after the Kurds, trying to link the PKK insurgents with HDP, is election politics by other means. And it seems that Erdogan got a former CIA director, Porter Goss, to dress it up for the Americans as an anti-ISIS action. Immediately, speculation was that the HDP would be weakened, the AKP would be strengthened. And why not? Erdogan and his allies probably feel that the Turkish people are no smarter than the gullible American audience in the film. But Erdogan and the AKP didn't count on Turks catching on to this game. Polls show that the HDP and other opposition parties are gaining, at the expense of the AKP. I found the Turks to be a pretty politically savvy population, able to see what's going on. Perhaps they had seen Erdogan play that game against the Israelis, or the followers of Fethullah Gulen who detected Erdogan's regime corruption, or even against the United States to score political points. Erdogan set the new snap elections for November 1, 2015. If he thinks another anti-Kurdish offensive disguised as anti-ISIS operations will help his party give him more political power, he should try a different movie strategy, perhaps the ending of the Oliver Stone film "Nixon."